Cars and vehicles are wonderful things when they are running correctly. A quick trip to work or the weekly grocery shopping, they come in very hand. On some occasions, a car just doesn’t want to start which can be a real pain. You will find yourself stranded until a friendly mechanic can take a look at it and diagnose your problem. There are one or two parts of a car that can cause bigger problems than just your vehicle not starting. Brake pads or the breaking system can be a harrowing time if you have a problem, as there is a good chance you will be in the car travelling when this part of your car shows symptoms or in a worst-case scenario, you find that you’re unable to actually stop. If you were travelling to the supermarket, just imagine the feeling that you put your foot on the brake and nothing actually happens. Passing the supermarket without being able to stop correctly would be bad enough, yet if a corner or junction in the road has to be encountered, you quickly come to realize how important your brakes actually are. If you find this has happened to you, or you want your braking system checked and you find you’re in need for a Brake Pad Replacement Las Vegas Mobile Mechanic can be just the company to call. We hold many brake pads in stock and can perform a quick change wherever your location is. This can be at the side of the road, at your place of work or at your home. We are conveniently located to service you wherever you are. Sometimes you brake pad replacement can be just a quick and easy job, yet there are occasions when there are other components that can affect the efficiency of not just your brake pads, but you whole braking system. 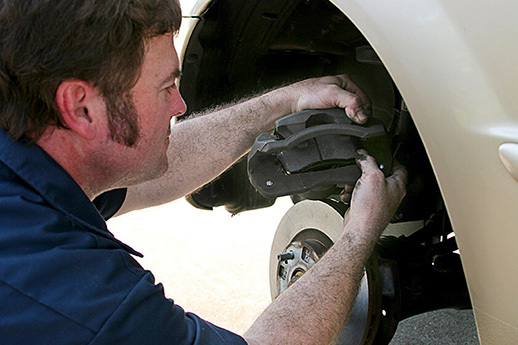 Las Vegas mobile Mechanic has mechanics who are highly experienced in changing brake pads or other braking components on any make and model of car. This can be either old or new models. With these components, some others that may require changing or looking at can be the brake hoses, rotors and the brake cylinders that actually control the stopping of your car. Las Vegas Mobile Mechanic highly advise you have your brake pads and braking system checked at your earliest convenience, this can save you more cost and work later on if any other component becomes damaged as your brake pads have worn beyond their useful life. If you wish to schedule a Brake Pad Replacement Las Vegas Mobile Mechanic can make this an easy operation for you to accomplish. Once completed you will be safe in the knowledge that your car will be able to stop when you actually want it to.